The Dabbling Crafter: Before & After: From Drab Paint to Fab Paint! Before & After: From Drab Paint to Fab Paint! As I said earlier this week, I was busy all weekend with projects. The big project was painting the bedroom/nursery. We have an abnormally large bedroom (a little larger than 24 feet by 12 feet). It used to be two different rooms (there's two doors to the room as a result). When we found out we were expecting, we had decisions to make. We have a guest room/man room we could convert to the nursery. I found two problems with this. We get quite a few out of town guests, and I did not want to find alternative homes for all my husband's hunting decor. The other option was taking half of our bedroom (which we weren't even using except one lonely dresser) and turning it into a nursery. That option seemed to make the most sense to us. We have decided that once baby starts to sleep through the night/is in crib, we are going to build a divider between the two rooms (which should work just fine since there are two doors). We rent, so closing in the space permanently isn't an option. Even though we rent, we do get to paint if we want. 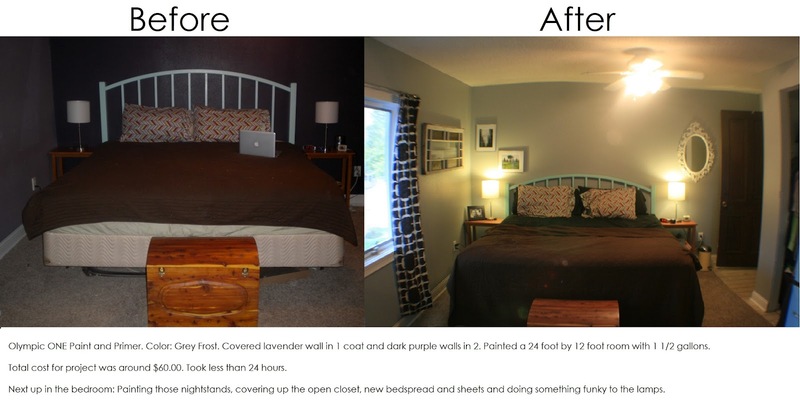 I have lived and complained about the purple walls in our bedroom since we moved in. (often on this blog). I couldn't stand the thought of having the nursery also purple mostly because I'd be forced to look at it the entire time I was on maternity leave. So, it was time to paint! I chose "Grey Frost" and Olympic ONE paint and primer in one (available at Lowes). The color isn't exactly what I want (although I still like it). The paint on the other hand was AWESOME. I have used paint from Walmart (terrible), Ace (fairly good) and even painted a room with the ultra expensive Benjamin Moore Aura (not worth the money). Click on the links for the projects that correlate with each paint. The room I painted with the BM took four coats. The Olympic paint only took 2 on the dark purple. And the Olympic is half the cost of the BM. Enjoy my "before" and "after" for the nursery and bedroom side. I think the grey works great with the unusual flooring. I still have work on both sides, but the color made a pretty significant difference. Click on the pictures to bring up the larger picture. Show & Tell: My daughter's first project!